The 1857 & 1858 1/4 Anna coin was produced in England by Soho mint and J. Watt & Co., Birmingham, England as the Indian mints were unable to keep up with the huge demand of 1/4 Anna coins during this time. 1857-58 were turbulent years in India and historically very significant. These coins were minted right up to 1862 after which the design changed to the 1862 Queen Victoria design. The obverse of the coin includes, East India Company arms, a shield quartered with escutcheon of France and England in the first quarter; crest of a lion rampant guardant holding between his forepaws the imperial crown proper; with supporters two lions rampant guardant each supporting a banner charged with a cross; below on a ribbon the motto, ‘AUSP REGIS ET SEN. ANGLIAE’ which translates to, under the auspices of the king and senate of England; above the ribbon, ‘1858’. All of this with a plain raised rim. At the centre of the reverse within a laurel wreath is, ‘ONE / QUARTER / ANNA’; Persian legend between single leaf ends of the wreath (yek pai; translation: one pice); around above, ‘EAST INDIA COMPANY’. The coin weighs, 6.42-6.47 gms, with a diameter of 25-25.5mm & thickness of 1.8mm. The edge of the coins is plain & the orientation is coin aligned. Over the years, collectors have discovered new varieties of 1858 1/4 Anna and these varieties have been documented well in all major publications. The basic difference in the varieties is on the reverse where the tips of the leaves may be formed from single leaves (Reverse I) or double leaves (Reverse II). This is most obvious at the tips of the wreath. On the obverse, I’ve come across 3 varieties out of which the third was recently discovered by my dear friend Arash Ilavia. The basic difference in all the 3 varieties is the alignment of the date. The first type is rare with the date in-line of the ribbon (Obverse A). 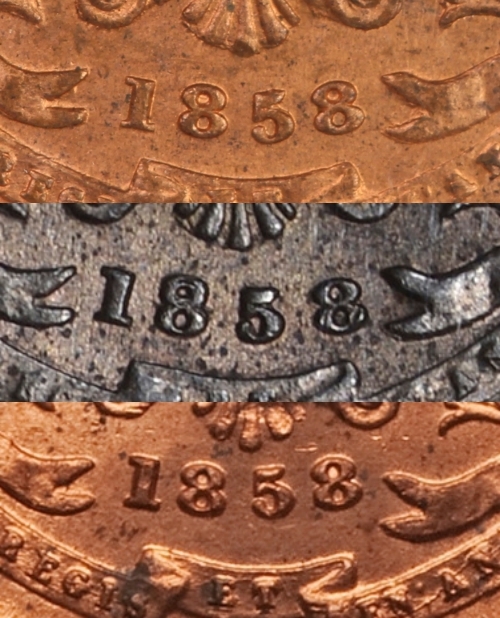 The second type is common with the date above the ribbon (Obverse B) and the third type is very similar to the first, however, the first 2 digits (18) of the date ‘1858’ are slightly above the remaining 2 digits (58), I’ll like to call this variety as Obverse A(a) and this type is currently not documented in any major publications. Also, the ‘1’ in this type is closer to the left ribbon than the other 2 types. All the obverse varieties are illustrated below. So far 2 different types of the 1857 1/4 Anna have been documented by collectors, Date inline (Obverse I) along with both the reverses (I & II, single leaf & double leaf). But with the 1858 1/4 Anna, with 2 obverse type & 3 reverse types, 6 different variants are possible. The table below summaries them.